Abstract: Bowling in cricket requires accuracy, repeatability, and speed control. Incorrect bowling action can result in poor performance and injury to the shoulder, lower back, and knee joints. In this paper, we present a wearable wireless technology suitable for everyday use by elite and recreational athletes alike. Wireless monitoring of front-on bowler actions using inertial sensors placed in the centre of mass results in clear signals, which can be interpreted in terms of run-up speed and length and hip rotation. For a bowler who was bowling submaximally, the run-up speed was 2.7 m/s with a predelivery stride length of 1.2 m/s and a hip rotation of 40°. This simple, inexpensive technique allows in-field bowling assessment and analysis and promises to be a significant training aid. Follow through after ball release. Figure 2 shows data from a sample delivery as well as acceleration and rate gyroscope data with respect to the vertical axis. Figure 2a shows the acceleration in the vertical axis with positive being the upwards direction and negative being the downwards direction. Figure2b shows the angular velocity around the vertical axis with a counter-clockwise rotation indicated by a positive direction and clockwise rotation indicated by a negative direction. Figure 2. Acceleration data (a) from the accelerometer in the vertical direction and the angular velocity data (b) from the gyroscope measuring rotation around the vertical axis. B, back-foot strike; F, front-foot strike. Bowling action events are clearly evident in Figure 2 with the run up preceding hip rotation and delivery. The run up consists of five steps before the back-foot strike (B). When the back-foot strike occurs, the bowler starts to rotate the hips in a counter-clockwise direction before the front-foot strike (F). When the front-foot strike occurs, the bowler starts to rotate the hips in a clockwise direction. While ball release is not apparent in either of the accelerometer or gyroscope data, additional sensors could be used in future. The order and timing of the bowling action matches both the video and the expected bowling order 13, which indicates that the inertial sensors placed at the CoM can pick up the order of the important events in the bowling action. Total hip rotation was determined using a short-term cumulative trapezoidal integration of the angular velocity after appropriate baseline removal. Hip rotation was found to be 40° of rotation in the counter-clockwise direction followed by a rotation of approximately 30° in the clockwise direction. It is assumed that the difference in the rotation is due to the angle of the foot and leg after the ball has been released. In the video, the bowler appeared to step across the body. Figure 3 shows the step rate, speed, and step length derived from ground contact events and period in the accelerometer data 2. The bar marked ‘B’ indicates the back-foot strike, and the bar marked ‘F’ indicates the front-foot strike. The first step, usually a hop, in the run up is omitted since the technique is not valid for this motion. This technique was developed from steady-state running by Wixted 2 and is a useful first-order approximation for analysis of the cricket run up, even though the bowling run up is very short with only a few steps. Figure 3. Step rate (blue), speed (green), and step length (red) derived from the accelerometer data in Figure 2. B, back-foot strike; F, front-foot strike. 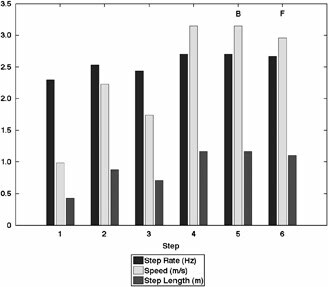 From Figure 3, it is apparent that the bowler starts the run up with shorter steps at a high step rate giving a low speed and ends the run up with a higher step rate and larger step length giving a higher overall speed. It can also be seen that the speed is consistent in a few paces prior to delivery, which is reported in the literature 13. The peak run-up speed can be seen to be approximately 2.7 m/s with a predelivery stride of approximately 1.2 m—which is consistent with the literature. Wixted AJ, Thiel DV, Hahn, AG, Gore, CJ, Pyne DB, James DA. Measurement of energy expenditure in elite athletes using MEMS-based triaxial accelerometers. IEEE Sensors Journal 2007; 7(4): 481–488. Davey NP, Anderson ME, James DA. An accelerometer-based system for elite athlete swimming performance analysis. Proc. SPIE. 2005; 5649: 409. Davey N, Anderson M, James DA. Validation trial of an accelerometer-based sensor platform for swimming. Sports Technology2008; 1(4–5): 202–207. Ahmadi A, Rowlands DD, James DA. Investigating the translational and rotational motion of the swing using accelerometers for athlete skill assessment. 5th IEEE Conf. Sensors 2006; 980–983. Harding JW, Small JW, James DA. Feature extraction of performance variables in elite half-pipe snowboarding using body mounted inertial sensors. Proc. SPIE. 2007; 6799: 679917. Harding JW, Mackintosh CG, Martin DT, Hahn AG, James DA. Automated scoring for elite half-pipe snowboard competition: important sporting development or techno distraction? Sports Technology 2008; 1(6): 277–290. Brodie M, Walmsley A, and Page W. Fusion motion capture: a prototype system using inertial measurement units and GPS for the biomechanical analysis of ski racing. Sports Technology 2008: 1(1): 17–28. Van Someren EJW. Actigraphic monitoring of movement and rest-activity rhythms in aging, Alzheimer's disease, and Parkinson's disease. IEEE Trans. Rehabilitation Engineering 1997; 5(4): 394–398. Liebermann DG, Katz L, Hughes MD, Bartlett RM, McClements J, Franks IM. Advances in the application of information technology to sport performance. J. Sports Sci. 2002; 20: 755–769. Portus MR, Sinclair PJ, Burke ST, Moore DJA, Farhart PJ. Cricket fast bowling and technique and the influence of selected physical factors during an 8-over spell. J. Sports Sci. 2000; 18: 999–1011. Pyne DB, Duthie GM, Saunders PU, Petersen CA, Portus MR. Anthropometric and strength correlates of fast bowling speed in junior and senior cricketers. J. Strength & Conditioning Res. 2006; 20(3): 620–626. Bartlett RM, Stickill NP, Elliot BC, Burnett AF. The biomechanics of fast bowling in men's cricket: A review. J. Sports Sci. 1996; 14:403–424. Dennis RJ, Finch CF, Farhart PJ. Is bowling workload a risk factor for injury to Australia junior crocket fast bowlers? Br. J. Sports. Med. 2005; 39: 843–846. Elliott BC. Back injuries and the fast bowler in cricket. J. Sports Sci. 2000; 18: 931–991. Kibbler WB. The role of the scapula in athletic shoulder function. Am. J. Sports Med. 1998; 26(2): 325–337.